People don't often "get" what it was like when Davy and I lost Elizabeth to multiple organ failure in 2010 and then Hannah to cancer in 2011. I have hardly any human family. Elizabeth, Davy, and Hannah were truly my loving and happy family that I couldn't wait to come home to each night. It was so wonderful to know such love and happiness. Davy and I lost our worlds with their deaths. It ended our family and our domestic joy. It ended all my research and one of my manuscripts. It ended our group prayers each morning where they all sat around me looking attentive as I read and prayed outloud. It ended all the playing, snuggling, and loving one another all the time. And it ended them greeting me at the door every night without fail. No more. Gone forever. Davy howled in grief (the most mournful cries I've ever heard) for weeks at being alone for the first time ever and I wept uncontrollably for months ... Some tears were for my own grief and some watching Davy's grief. It was only by God's grace and thanks to a few people that reached out that I learned to manage my tears in time, but the daily former joy that once existed with them was gone forever. Davy and I simply did the best we could. We went for car rides, we volunteered at the bookstore, I worked virtual alot, and stuck to each other's sides like glue. When Sarah finally came along in 2014 things were okay, but Davy and her never bonded tightly like he was with Elizabeth. He was just no longer alone with her presence. They occasionally kissed noses, but nothing more. And only he waited for me at the door. When little Katie joined us in 2016, Sarah and Davy shifted into parental roles, but again it still wasn't anything like the original clowder. There wasn't huge playtimes together or snuggling with one another. It was an occasional lick or friendship tail and lots of guidance from them for Katie who is non-stop motion most of the time. They were, however, very kind and patient with Katie. 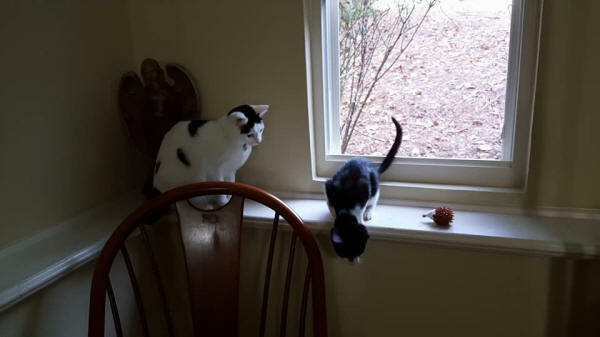 ❤ All three of the kitties display their friendship tails most of the time now, not just occasionally. Davy accepts Micah and purrs. 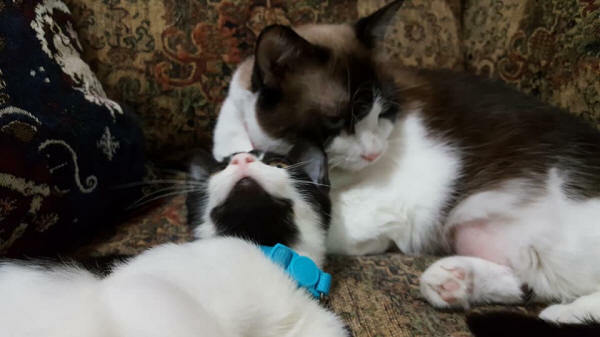 Sarah and Micah love each other (grooming and attempting to snuggle). And Katie is already to play with him. I walked in tonight, tired after another twelve hour day, and broke out in immediate roarimg laughter being greeted at the door by Katie zooming circles around Davy. Sarah was close beind laying next to Micah's playworld. Each morning and night I carry Micah (who is still quarantined in his Playland at this point) to each kittie for a short greeting. Tonight's was no less wonderful. 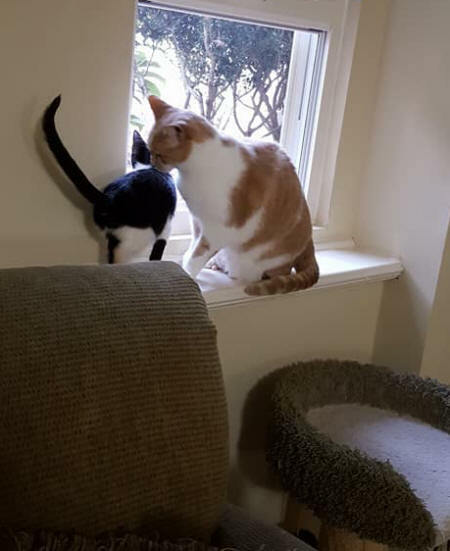 Davy purrs and lets him sit in the window for a minute before I whisk Micah off, then Sarah licks and snuggles and Micah attempts to nuzzle up to her. And Katie tries to play with Micah. And then it hit me ... The happiness and laughter upon entering home this evening combined with the happy feline greetings ... I did have joy again. It will never be the same as the first clowder. Those special moments are forever gone, but it does appear that there can be joy after grief in a new way when it is time. It took 6 years for me to feel it again. I didn't think it was possible, but yet here it is. I thought adopting little Micah (who was sickly after people hung him) was to help him, but it appears that he may be bringing new joy to all of our lives and bonding each of us in deeper ways to one another.